San Francisco | Admin Awards - The first and only awards program in the U.S. that publicly recognizes the invaluable contributions of Administrative Professionals. Now accepting applications for the 2019 San Francisco Admin Awards Advisory board. To learn more click here. Above the Call AwardStacey Speizer, Uber Technologies Inc. Leadership AwardKristina Conaway, Moogsoft Inc.
Stacey Speizer, Senior Executive Assistant to CEO, Dara Khosrowshahi, has over 15 years of experience, including 4 years at Uber. Stacey has provided support to top Executives and C-levels including Ryan Graves, Uber Board Member and SVP of Global Operations, all while spearheading EA and administrative projects across the entire Uber organization. During her time at Uber she has interfaced directly with foreign leaders and dignitaries, planned events for over 10,000 people domestically and internationally and helped champion new way's for Uber to give back to the community. As a Bay Area native, working in tech comes organically and she was previously with Accel Partners, a VC firm in Silicon Valley for 10 years. Sarah Best is an experienced business services administrator with more than 25 years of experience in high tech and professional services industries. She currently serves as the Director of Administration for the West region offices of Grant Thornton LLP, with her home office in the San Francisco Bay Area. Throughout her career of professional accomplishments including complete office build-outs of more than 3 facilities, full-scale workplace functionality and space planning for more than 15 business groups, ground-up administrative and workplace solutions development and services implementation for large business teams of more than 300 people and the development and implementation of numerous fiscal efficiency programs, the accomplishment she’s most proud of is successfully balancing her work and personal life. Outside of the office, Sarah is all about family. She enjoys spending time with her husband Al and daughter Ella, gardening, cooking and family trips to Santa Cruz every fall. While police officers and dispatchers are striving to take care of the public they serve, who is taking care of them? In our organization, the unequivocal answer, Leslie Salazar. In a time when it is so challenging to keep us all together, Leslie is the glue. Leslie stepped into her role as our Management Analyst/Executive Assistant to the Police Chief almost three years ago, and her impact was immediate and far-reaching. It’s impossible to list all of the things Leslie does on a daily basis to keep our organization afloat; she simply does anything and everything that is needed. The Chief of Police will often say that Leslie runs the police department, and this is hardly an exaggeration. Leslie is intelligent, ridiculously hardworking, and willing to take on just about anything you can throw at her. Just as importantly, she maintains an amazingly positive attitude and an undying smile. The importance of this, in a modern-day policing organization, cannot be overstated. What Leslie Salazar does not only benefit all the men and women of the San Bruno Police Department but has a positive impact on all the people that those men and women come into contact with each and every day. Kristina is the Head of Executive Office at Moogsoft, supporting the CEO, COO, CFO and SVP of Engineering. She has been fostering her top-notch organizational skills and passion for helping others by ensuring the backbone of the company is prepared and ready for what each day brings them. In addition, she is the US Operations Manager and leads a team of rockstar Office Admins to ensure the Moog Way is presented throughout all of the offices. Originally from Wisconsin, her desire to be in the heart of tech is what brought her to the Bay Area six years ago. Prior to Moogsoft, she worked for AppDynamics and Jawbone after obtaining a BS in Human Resource Development and Business Marketing Ed from the University of Minnesota. During Kathleen’s 45+ year administrative career, she has enjoyed, and has had the privilege of, working with, and being mentored by, C+ executives spanning the industries of banking, legal, real estate, technology, and venture capital both in New York and San Francisco. Her responsibilities have ranged from the administration, event planning, project and team management to public relations. In 2004, Kathleen was recruited by then Salesforce CFO, Steve Cakebread, to assist with Salesforce’s initial IPO. As Salesforce evolved from a pre-IPO start-up to the tech giant it is today, Kathleen’s roles and responsibilities grew and expanded. Today, she has the honor of working alongside current Salesforce President and CFO, Mark Hawkins. Kathleen was born in Flushing, New York and raised in the Bronx. She attended The Wood School and Hunter College. In her free time, Kathleen enjoys art, fly fishing, travel and, her passion, giving back. For the past 18 years, Daniela has organized, coordinated, and managed the business and personal activities of Keith Krach, Chairman of the Board, DocuSign. She has worked tirelessly at Keith’s side, keeping this hyperactive whirlwind of industry-focused, organized, directed and protected--as he focused his time at Ariba, Sigma Chi Fraternity, Angie’s List, Purdue University, and most recently (for 10 years), DocuSign, and all 49 of the companies Keith has advised and consulted with over the years. Daniela’s work goes beyond the office and the boardroom to include organizing Keith’s personal and family life, including finances, board obligations, and business and family travel/logistics, including management of a private aircraft, and countless trips for everybody, everywhere for every reason. According to Krach, “Daniela’s capabilities literally have no bounds, and she is the personification of loyalty. The incomparable breadth and depth of her commitment make her a role model of her profession more than worthy of emulating.” A native who grew up in the Bay Area, Daniela lives in Redwood City with her husband, Michael, daughter, Juliana, son, Dominic, and Yorkie terrier, Jack. 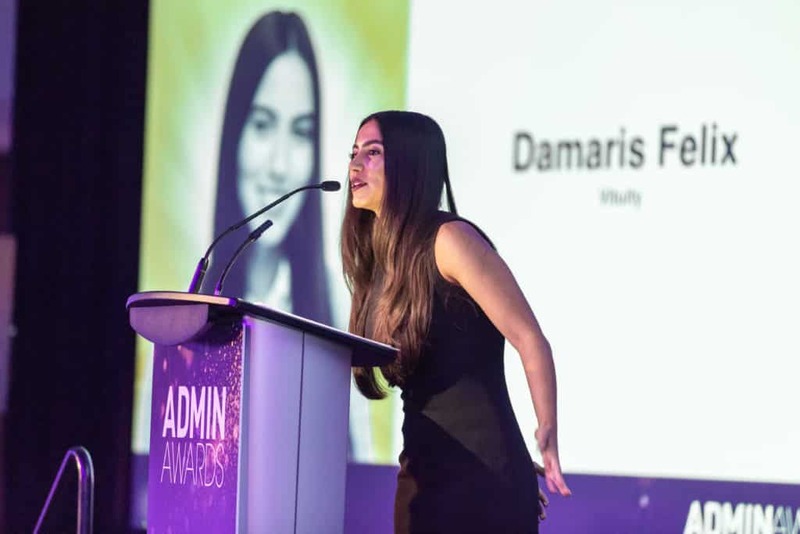 Damaris has been an administrative professional with Vituity since August 2017. She supports the business and development of Vituity’s various practice lines. As a recent Cal graduate, she jumped into the healthcare world with an eagerness to learn and a positive attitude. Damaris works alongside her team and department to ensure that things are happening timely and efficiently. During her free time, she enjoys nature, film photography, and ceramics. Brittney is one of Vituity’s energetic administrative professionals who supports Business Development’s leadership team; including C-suite executives, VP’s and Physician leaders. She has been with Vituity for almost two years, starting as an intern then getting promoted full-time as an administrative coordinator. Not only does she assist with Business Development’s sales cycle with those she supports, but she also collaborates and contributes to the team and each member individually. She fosters a vibrant, professional, working environment for those around her, from planning team outings to office pranks. She brings laughter and positive energy during stressful times, which has been appreciated by her colleagues. In her free time, she works as a Communication Strategist for local city council campaigns and is a teaching assistant for interpersonal communication and public speaking at four universities in the bay area. Lorena is passionate about bringing joy and ambition to each of her Administrative roles. Through her 23 years of supporting C-suite executives, she has been committed to sharing her vibrant energy with each of her teams. Before joining Dictionary.com in 2016, Lorena worked with the same CEO at several start-ups over 10 years. She was instrumental in creating fun and collaborative cultures within each company. She joined Dictionary.com as the Executive Assistant to the CEO, a role she also held at its sister company, Ask.com. It was here she helped found the “Fun Crew,” which hosted company events to promote an engaging and fun team culture. Lorena has worked in various industries, including heath care and finance. She has also planned client events, encouraging great business relationships with clients. Lorena enjoys running, gourmet cooking, and wine. She holds an AA from the University of Phoenix. Kelly Huang joined MedAmerica in November 2015. She is currently the Executive Assistant to 4 Regional Directors and is the Lead EA for the Emergency Medicine operations. She works alongside her Manager and Director to strategize and implement the best processes. Kelly enjoys food adventures, being surrounded by greens and nature, kayaking and adventuring around the world. Sue Allen is a passionate, enthusiastic C-level Administrative Professional with over 30 years of experience. She continuously strives for a challenge and the chance to be an outstanding strategic business partner to her Executive. Her diverse background in the finance, beverage, high-tech and biotech industries has leveraged her attention to detail, strategic thinking and problem solving skills to align with organizational effectiveness, while working on controlling daily chaos, creating new processes and leading or participating in multiple projects. As a collaborative team player, Sue loves to network and work alongside her fellow Administrators and has been an active member in the IAAP, ASAP, AEAP and Silicon Valley Catalyst Association. She currently holds a certificate as a Certified Executive Administrative Professional (CEAP). When Sue is not in the office, you will find her spending quality time with her family and friends hiking, kayaking, cycling or working as an active volunteer in numerous charitable organizations. Monica Cheng has over 15 years of experience holding diverse roles in a variety of industries. Monica takes pride in supporting Synopsys’ business organizations in achieving high quality results. As a manager and an Executive Assistant at Synopsys, Monica supports the General Manager of the Software Integrity Group, one of the highest growth business units within the company. In addition, she leads an elite team of Executive Assistants in supporting the leadership team to attain success. Monica provides guidance to her colleagues with her vast institutional knowledge. She regularly participates in the organization of key business initiatives, including the planning of many high-impact conferences, off-sites, and quarterly business reviews. Prior to joining Synopsys, Monica held management positions at Bank of America and various Administrative roles at the law firm of Coblentz Patch Duffy & Bass. Monica received her B.S. in Business Administration from San Francisco State University. Ruth is an Executive Assistant at Salesforce and supports the EVP in Strategic Business Operations. In her four plus years at Salesforce, she has organized numerous volunteer events, been a leader across the entire organization by facilitating the Worldwide EA Google Resource site, and planned and hosted “Lunch and Learn” sessions for EA’s. As a graduate of Sacramento State University with a degree in Liberal Studies, Ruth’s career has taken her across the U.S. to live in Houston, TX, and Pittsburgh, PA, before returning to where she grew up: the San Francisco Bay Area. Prior to Salesforce, she worked for Signature Properties, Catellus, Williams Sonoma Inc., and Visa. Ruth is the caretaker of a certified therapy dog: golden retriever, Dexter. Together, they volunteer at Family House in San Francisco, Gladman Rehabilitation Center, Pixar, and Paws to Read. One of their favorite things to do is visit the library so kids can read out loud to a wonderful dog who does not interrupt. Outside of the office, Ruth has completed 30 half-marathons, one Tough Mudder, and enjoys camping with family and friends. Hannah is the go-to, get-it done girl for Woodside Hotels, a collection of upscale, independent hotels in Northern California. She has been an Executive Assistant at Woodside for 6 years, keeping the office running smoothly and jumping into marketing and corporate initiatives with a can-do attitude. In her role, she assists the President/CEO and the Vice Presidents of Finance, HR, Operations, and Sales & Marketing. She approaches her tasks and projects with an innovative and intuitive approach that is both logical and creative. Previously, she worked at Positive Coaching Alliance, a non-profit organization dedicated to teaching life lessons through sports. She served as the Executive Assistant to the Founder/CEO for more than 5 years. At the core, she is a passionate Administrative Professional who loves a challenge and is always ready to contribute, support and make a difference. For over a decade, she has dedicated her career to assisting leaders in achieving their goals efficiently and effectively. When she’s not working, Hannah enjoys spending time with her husband and daughter exploring the outdoors. Rachel Gonzalez is the Executive Assistant of the Co-Founders of Cloudflare: Matthew Prince, CEO, and Michelle Zatlyn, COO. She has more than 10 years of experience in providing C-level support to top Executives at companies like Facebook and Electronic Arts. As a Bay Area native, she loves being in the center of the technology industry and working for a company at the forefront of the Internet evolution. Rachel graduated from FIDM with a Product Development degree, but quickly fell in love with the Admin role in one of her first jobs out of college. Being an Executive Assistant for the last 17 years has been so much more than just a career for Lisette, it's been a way of life that has taught her so much more than she could have ever expected. Throughout her career, Lisette has been lucky enough to work with extraordinary Executives who have become trusted mentors, advisors, and friends. In this position, you have the opportunity to impact many people and that has been one of the most rewarding aspects of her role. Lisette is not only extremely grateful that her team would be so thoughtful to nominate her for this prestigious award, but she is truly honored to share the space with such a stellar group of professionals. The learnings, wins, challenges, people, and experiences have truly been the highlights of her career. Brandon cut his teeth in hospitality and sales before being bitten by the startup bug. Possessed with an entrepreneurial spirit, he took a part-time, temporary position at a hot start-up called IFTTT. Two years later, he holds the title of Office Manager, where he oversees facilities, events, and the IFTTT office experience. Outside of IFTTT, you’ll find him at a sidewalk cafe in a foreign country or a Bay Area farmers market. Brandon is a proud history buff, locavore, and podcast enthusiast.